Due to the special sophisticated equipment that must fill the Stanaplex50, we are unable to use the white flip caps. As a result we are currently capping the vials with a red aluminum cap. This decision was made to ensure maximum sterility and accuracy of what is inside the vial. We are waiting for more professional photos to be taken but we have added 2 additional photos of the stan settled and when it is re constituted. 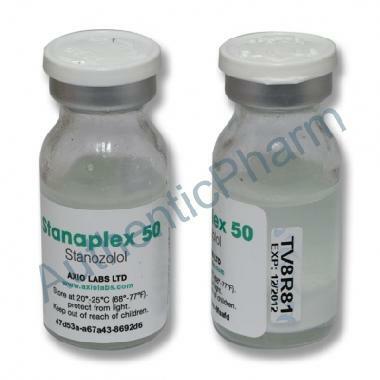 Anabolic steroids such as Stanaplex are synthetic derivatives of the male hormone testosterone. Stanozolol has a pronounced anabolic effect with fewer masculinizing side effects than testosterone and some other synthetic anabolic steroids. Anabolic steroids are used in stimulating appetite and increasing weight gain, strength, and vigor. They should be used as a part of an overall program with other supportive and nutritional therapies. This is a very popular anabolic steroid, which is a derivative of dihydrotestosterone. Winstrol is a relatively low androgenic steroid which will not aromatise. It is moderately toxic to the liver. Very few users report any water retention or any other side effects while using Winstrol. It is a popular drug for cutting in a stack with Primobolan or Parabolan. When stacked with Testosterone it can be very effective for a size and strength gain. Women use the drug quite often, but it can cause virilising effects for some women even at low dosages. Most of the muscle gains made while taking the Winstrol are retained after the drug is discontinued. The injectable form is better than the oral. Many feel that the injectable must be administered at least twice a week: some take shots every day for better effects. Dosages range from 3 to 5 cc?s per week for men, 1 to 2 cc's in women. .